Read this great testimonial from one of our participants! Over the course of a year, we provide dozens of workshops to hundreds of participants. Time and time again, we receive great feedback. Most of these testimonials happen in passing, or we see the results directly on a participant’s face. Occasionally, our participants take the time to brighten OUR day by writing us with feedback. We wanted to share one such letter. We hope it brightens your day as much as brightened ours! 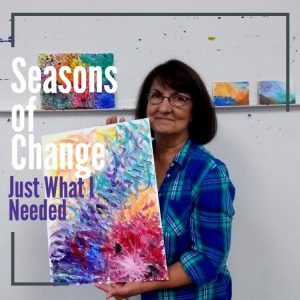 I was deeply moved by participating in the workshop “Seasons of Change”. I was ready for a new experience of creative expression that was more spontaneous than usual. I have done all kinds of art that are more detailed and exact. That day I came mentally prepared to “let my creative juices flow”. At that moment I gave myself full permission to paint without intent or criticism. I’m not sure exactly what part of the introduction touched me, but I dipped the q-tip into the paint and the minute it touched the canvas tears began to roll down my cheeks. 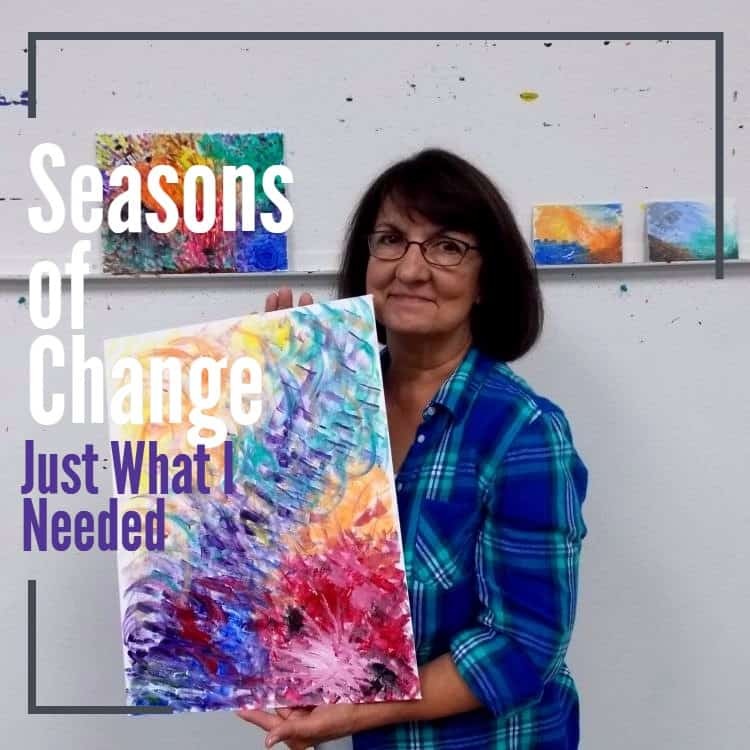 I picked colors that most closely expressed the emotions I associated with grief, loss and stepping into a new season of life. It helped because we had a time limit and I couldn’t dawdle over choosing the colors. First I chose to paint blue for my spirit that is at peace in a swirl. Around it I painted a blend of purple to represent the royalty of peace enriched by the love of the Holy Spirit – a life that is richer and more vibrant than what I have been living. I created an area of red strokes representing the deep love in my heart that became a burst of orange as the love is touched by the light of yellow joy as I connect with others in friendships. In one corner there is green and brown representing the life in nature. On top of that I splashed strokes of black representing the darkness of the death of my husband. Smaller black dots represent the losses of many other loved ones, including a still birth in 1983. I placed a patch of white over the large blackened area to represent the hope that I hold in the midst of the pain. Finally in the upper right hand corner I applied green to represent the fresh new life in Spring. I added several strokes of red and blue to signify the fruit I hope to reap from engaging in the new season as I travel through this season of change. Finally I decided to paint a patch of brown at the lower edge representing the earth – where my life originated and where it will end some day. 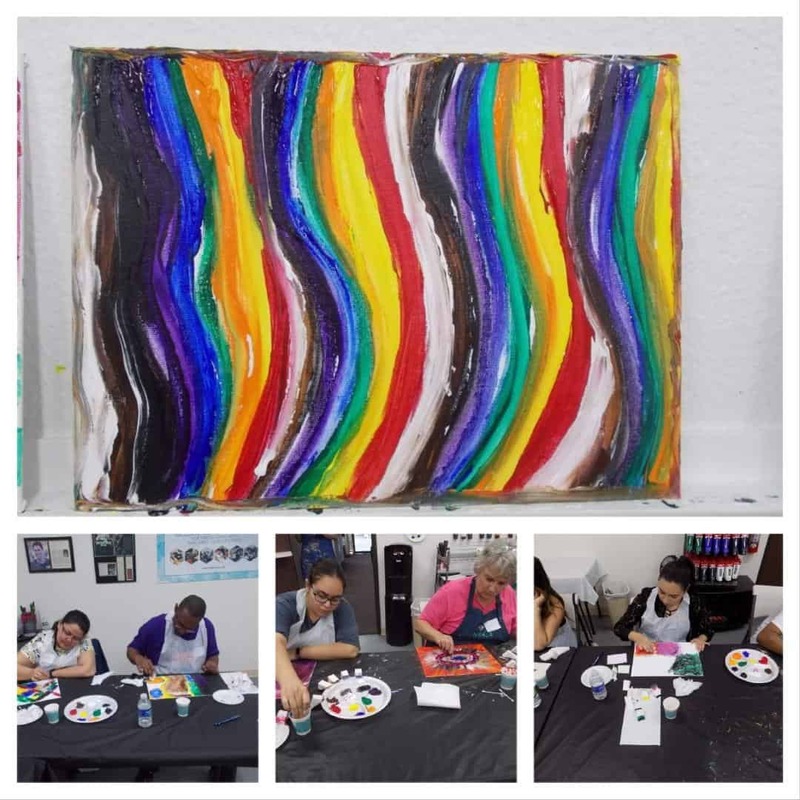 I noticed the strokes of my sponge and q-tip were pounces, like the abundance of emotions that began bubbling inside as I continued to paint in more colors. I can’t remember the words I used to share about my piece that I used that morning. I was so sure I would not forget them. But at the end of the workshop I felt drained, relieved and overwhelmed all at once. I believe I accomplished more healing of emotions in that one morning than I had in six months of counseling sessions. 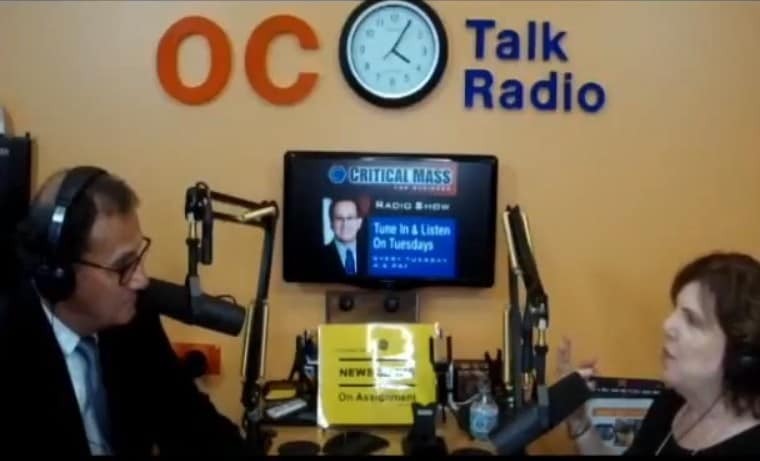 Thank you, Laurie, for making this workshop available to me. I believe a new experience of healing began for me as the result of participating in the workshop. I don’t think my pieces are my favorite “paintings”, but as I wrote this email I realized how meaningful each piece is to me. I have been able to start redecorating my home and seeing myself less emotionally handicapped by the painful events of my life. I want my home to represent this new season. I have shared about the workshop with several of my friends. 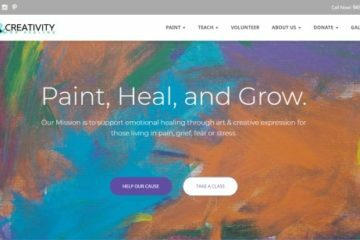 I hope to stay connected with Art4Healing and take other workshops and maybe even volunteer in the future. Are you inspired? 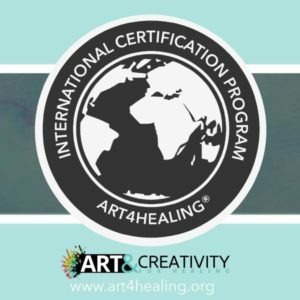 If you would like to have your own art healing experience, check out our catalog of workshops and our online courses.